Wolraad Woltemade and her sister ship John Ross were in their time the most powerful of their kind on the planet. This pair of South African tugs, or salvage vessels, patrolled the seas around Cape Point and further afield. According to contract, one of them was required to remain in port to handle any emergency, while the other was free to roam the high seas competing for international salvalge prizes. And work there certainly was – with the constant traffic of overweight supertankers going around the point there was almost always someone in trouble. 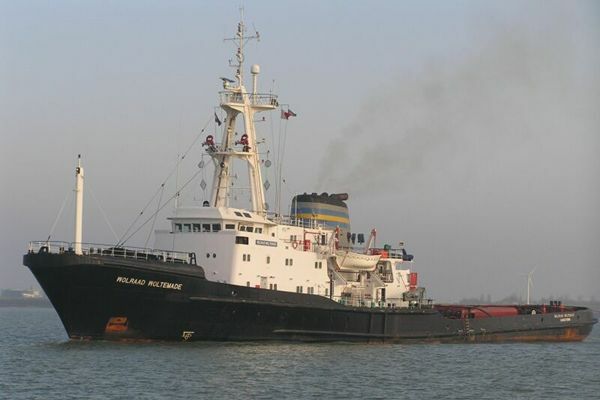 Wolraad Woltemade was built by Robb Caledon Shipbuilders in Scotland and delivered to Safmarine in Cape Town during 1976, while her sister ship John Ross was built by the Durban shipyards of Elgin Brown & Hamer. These immensely powerful vessels were powered by two Mirrlees-Blackstone type KVMR16 diesels with 19,200 bhp (14,132 kW) – providing unmatched pulling power. They were 94.6 metres long. Ownership of these two sisters has been transferred between Safmarine, Pentow Marine and Smit Marine Cape Town. Current owners have renamed John Ross to Smit Amandla. Wolraad Woltemade’s time has unfortunately run out. 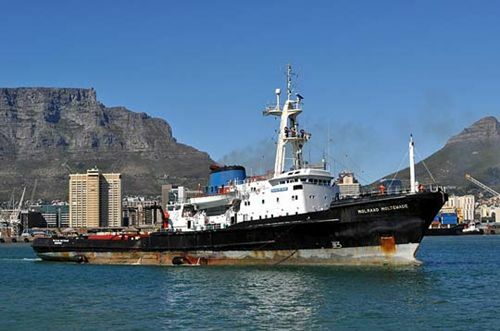 The ‘Standby Tug Contract’ requires the presence of one tug in a South African port at any given time, a duty that has for some years been taken up by her sister tug Smit Amandla. This contract was due for renewal in November 2009, but the South African goverment decided not to renew – leaving our coast unprotected for the first time in 30 years. She was unable to find a buyer, and her somewhat ignomius end is that she has been sold as scrap. As can be seen from the accompanying photograph, she is riding high, and showing signs of her age. All insignia have been removed in preparation for the breakers. She has since sailed from Cape Town, appropriately her last port of call, and is now awaiting her fate at the hands of the breakers.